A plunger is an Upperman reversal pattern. The plunger is intended to be used as a trading tool only, and should be used in conjunction with other Floyd Upperman and Associates trading tools and strategies. The plungers are not intended to be an independent trading strategy or system. Current and past Plunger formations are noted on the charts using specific colors and/or symbols. 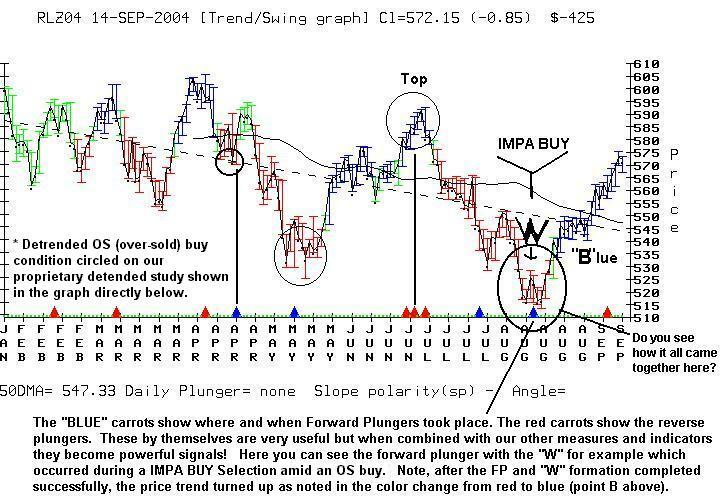 For example, a daily FP would be noted with a BLUE carrot on the x-axis of the daily trend/swing price graph. A weekly FP would be noted by a painted BLUE weekly price bar on the weekly price chart. Daily and weekly reverse plungers (RP) are noted the same way, except the color is RED. The plunger reports provide a listing of all current plungers. The plunger reports also provide entry point price ranges, logical stops, and calculated monetary risk. The Plunger Pattern Recognition program identifies active plunger formations. The criteria for the daily plunger = For a daily FP to form, the most recent intra-day high must meet or exceed a 10-day high. For a daily RP, the most recent intra-day low must meet or exceed a 10-day low. Secondly, the most recent closing price (latest intra-day update or final end of day closing price) must be in the top or bottom 30% of that days range. For a RP, it must be in the bottom 30%, for a FP it must be in the top 30%. The daily plungers can occur and will be noted on our charts as they form on an intra-day basis as well as end of day basis. HOWEVER, the only plungers considered official are the ones that form based on closing figures. Additional criteria for the daily plunger - The entire price range must also be at least 1/3 of an average days price range (for each specific market) for the plungers to occur. This eliminates plungers with extremely tiny intra-day ranges. Weekly Plungers - The criteria for the weekly plungers are similar, except we are evaluating data on a weekly basis as opposed to daily. The close on Friday is the most important price of the week and this is when all weekly plungers are confirmed. The same is true with daily plungers as well, that is, they are confirmed ("official") on the final official close of the normal trading day (based on the traditional trading hours which is still where most of the volume occurs, even though markets trade virtually around the close today). One of the benefits of identifying plunger formations is that they provide excellent logical stops. If it turns out that the plunger pattern did identify a crucial turning point, the low/high of the plunger should not be penetrated. In other words, if the market moves higher following a forward plunger day, the low of the plunger day should not be penetrated. Thus, this is a logical area for a protective stop. Likewise on a reverse plunger day, if the market moves lower, the high of the reverse plunger day should not be penetrated. This is also a logical place for the protective stop. Plunger Pattern Criteria - A plunger pattern occurs when a 10-day high or low is reached or breached and the market reverses itself intra-day and closes at the opposite end of the 10-day high or low. For the plunger to officially occur the closing price must finish in the top or bottom 30% of the day's entire range. Plunger Pattern Expectations - Plunger patterns on average are expected to produce a market reaction (in the direction of the plunger) with a duration of 1 to 3 trading days. FP = Forward Plunger: Forward Plungers can occur at or near short-term bottoms, occasionally occurring at major turning points. RP = Reverse Plunger: Reverse Plungers can occur at or near short-term tops, occasionally occurring at major turning points. Reverse Plungers can occur at or near short-term tops, occasionally occurring at major turning points. Forward Plungers can occur at or near short-term bottoms, occasionally occurring at major turning points. * Keep in mind that this pattern, not unlike other patterns, will not work 100% of the time. Sometimes plunger patterns will occur and the market will move in the opposite direction (opposite of what we anticipate when a plunger occurs). This happens with all identifiable price patterns and is normal. How and when/where to enter based on this pattern alone, and where to place the stop. One of the things I really like about this particular pattern is the identifiable stops. It is clear with this pattern where the stops must be. They must be above or below the plunger highs or lows. See examples below in figures 1.2, 1.3 and 1.4. The entry is also very straight forward. The trader can enter as soon as the pattern is discovered, but must enter before a significant move has occurred and before the market turns back the other way, taking out the plunger high or low (shown below). I would avoid buying or selling gap opens, or sharp moves immediately following the pattern. Market orders, limit orders and stop orders can be used for entry. The pattern would be negated (voided) if the opposing plunger high or low is taken out. Again also, I would avoid buying or selling sharp gap openings that immediately following the formation. Plunger Pattern Criteria - A plunger pattern occurs when a 10-day high or low is reached or breached and the market reverses itself intra-day and closes at the opposite end of the 10-day high or low. For the plunger to officially occur the closing price must finish in the top or bottom 30% of the day's entire range. The specifics for both Forward Plungers (FP) and Reverse Plungers (RP) are provided below. Forward Plunger (FP) - This will occur when a market meets or exceeds its 10-day low and then reverses intra-day and closes in the upper 30% of the day's range. A market's full range is 0 to 100% with the low of the day corresponding to 0% and the high of the day corresponding to 100%. Thus a market that finishes on its high finishes at 100% and a market that finishes on its low finishes at 0%. This percentage figure (close as a percent of range or cl%ran) is provided daily in all markets in the daily excel report. The figures are listed in column "L" of the daily excel report. The same criteria applies to weekly plungers as well with the only difference being weekly plungers consist of weekly data and daily plungers consist of daily data. The cl%ran for weekly data is also provided in the weekly excel report which is also updated daily. It should be noted that the weekly plungers are not officially complete until Friday's close. Nevertheless however the day to day cl%ran figures for the weekly closes are updated automatically each day in the weekly excel report (column 7). The weekly excel report is only available on the automated reports page. Reverse Plunger (RP) - This will occur when a market meets or exceeds its 10-day high and then reverses intra-day and closes in the lower 30% of the day's range. A market's full range is 0 to 100% with the low of the day corresponding to 0% and the high of the day corresponding to 100%. Thus a market that finishes on its high finishes at 100% and a market that finishes on its low finishes at 0%. This percentage figure (close as a percent of range or cl%ran) is provided daily in all markets in the daily excel report. The figures are listed in column "L" of the daily excel report. The same criteria applies to weekly plungers as well with the only difference being weekly plungers consist of weekly data and daily plungers consist of daily data. The cl%ran for weekly data is also provided in the weekly excel report which is also updated daily. It should be noted that the weekly plungers are not officially complete until Friday's close. Nevertheless however the day to day cl%ran figures for the weekly closes are updated automatically each day in the weekly excel report (column 7). The weekly excel report is only available on the automated reports page. The market must follow through in the direction of the plunger pattern (forward=up, reverse=down) within 3 days following its formation. In the case of a forward plunger, the market must exceed the plunger day high within 3 days following the plunger, else the plunger expires. In the case of a reverse plunger, the market must exceed the plunger day low within 3 days following the plunger formation, else the plunger expires. During the 3-day period, the opposing plunger day high or low must not be exceeded on a closing basis. We will address that below. However, it is possible for a secondary plunger to occur within 3 days of the initial plunger formation. In that case, the new lows and highs of the secondary plunger pattern take precedence over the prior plunger day high and low. The high and low that is struck on the day a plunger pattern is formed are very important. In the case of a forward plunger, the low struck on the day the plunger pattern forms becomes important support or what I refer to as "the logical stop area". An example is the 7/24/02 Forward Plunger low of 773 in the September S&P500 futures. If this low is exceeded on a closing basis, the plunger is no longer valid. In the case of a reverse plunger, the high struck on the day the reverse plunger forms becomes very important resistance (logical stop area). If that high is exceeded on a closing basis, the plunger will no longer be valid. Failed Plunger Patterns - Plunger Patterns that immediately fail indicate a potential trade in the opposite direction (i.e. a forward plunger than immediate fails is often a good sell signal). MORE REAL EXAMPLES VIA RECENT REAL MARKET CONDITIONS (our graphs as it happened). * Past performance is not indicative of future results, no trading system can guarantee profitable results. * The reverse plunger (red carrot following A) FAILED via a close higher which turned that RP into a BUY too! 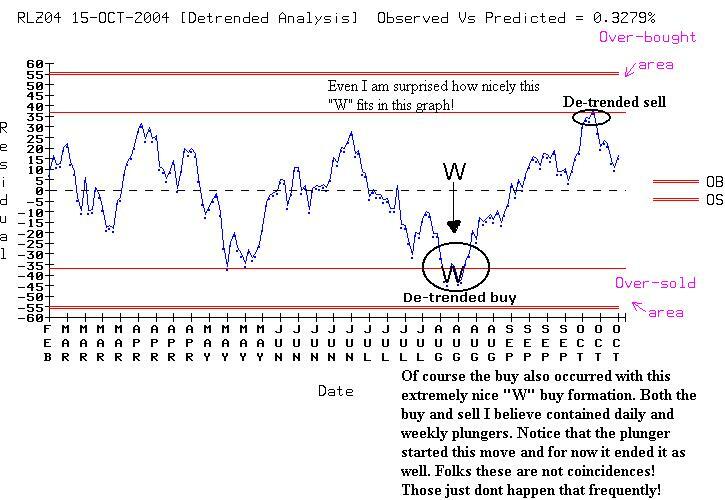 Daily Trend/Swing graph with associated Detrended study while trend from A to B still unfolding on 9/14/04. Core UCL/LCL graph for Russell. Note August net-com peak exceeds EUCL (extreme buy trigger)! Futures & options trading involves risk and may not be suitable for all types of investors. Trading is a risky business, and people do lose money trading futures contracts and options on futures. There are NO implied guarantees or promises of success made on this website anywhere. All futures trading is risky regardless of the methods, techniques and/or rules to manage and/or contain risk. No trade is risk free and trading is not Floyd's only means of income. Floyd makes no guarantees for success. Past performance is not a guarantee of future profits or future success. The markets are volatile and constantly changing. To survive in this business, one must learn to recognize risk, not to fear it. Successful trading is simply exploiting risky opportunities. One must learn to recognize what it means to be in the right place at the right time, and have the courage to do something with this knowledge. Floyd Upperman is a full time trader, investor, advisor and businessman. Floyd is recognized throughout the world by a growing audience of professionals for his work with the U.S. government Commitments of Traders (COT) reports. Floyd has been a registered commodity trading advisor (NFA# 0281183) for the last 10+ years and is currently president of Floyd Upperman & Associates. All market data on this website is provided "as is" for informational purposes and reference. Floyd Upperman & Associates does not make any express or implied warranties of any kind regarding the data contained on this website. Floyd Upperman & Associates shall not be liable for any data errors or for any damages resulting from misinterpretation of data, errors in data and/or inaccurate data. We do work very hard to ensure accuracy, but we do not guarantee it. Our trading strategies and information is accessible by membership only. The membership areas provide access to our proprietary trading products. These products include our trading strategies, unique market indicators, trading tools, market graphs and charts, unique COT studies and charting programs. All access to our trading tools must be authorized by Floyd Upperman & Associates. Access requires membership to our service. Any other access, by any other means, including theft of a username & password, as well as illegal access via "computer hacking" is prohibited and obviously not allowed. We consider all such access and attempts to access to be the same as illegal breaking and entering our property. A unique username and password is provided to each member. This unique username and password protects our property while providing authorized access to members only. No other access is permitted and no person, business or entity (e.g. robots) are authorized to access the members areas. Any successful penetration will be considered "breaking and entering" and may be prosecuted to the fullest extent of the law. Final warning, if you are thinking of or attempting to access our website by illegal means (without an authorized username and password) we will record your activity and do everything in our power to identify and prosecute you to the fullest extent of the law (civil and/or criminal prosecution). We will also seek to recover any and all damage done to our business, including damage to the secrecy of our intellectual property.